Want some graphics for Facebook and Twitter? Click here! We have produced a range of posters and signs for you to use at home, work or any event you are organising. 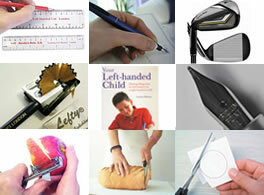 We would love to hear about anything you do to raise awareness on Left Handers Day. Our posters are A4 (similar to US Letter) size Adobe PDF files for you to print on your colour or black and white printer. If you have larger format print available that should work fine too. To print the Left-Handers Day posters click on the images below ( or you prefer to download all the files at once, use this zipfile). You will need Acrobat Reader in order to open and print the poster files. If you do not have Adobe Acrobat Reader installed on your computer, click here to download it first (free). Don’t forget you will need the free Adobe Reader software to open the poster files. Hey, Robert–ever try folding bed linen with your right-handed wife. I’m married to a northpaw, too, and it must be a funny thing to watch us try to coordinate a sheet-folding activity or anything else that involves handed dexterity (hmmm . . . “dexterity” . . . there’s another word with built-in prejudice against us). I’m still learning things about left-handers. Left-handers thread belts the opposite way from right-handers, so belts with writing on are upside down. Left-handers put their right arm in jackets first, so parents should be aware of this when assisting children to dress. In our family of 7 kids only 2 of us where the chosen ones to be lefties. I am a totally left hander. I am an upholsterer so I use hammers in my left and I have several pairs of left scissors. They are always sharp because others can’t use them cutting things they shouldn’t. I think lefties are creative. We can’t all be lefties because the world isn’t ready to be perfect. I love being a leftie. I took an acrylic painting class and the teacher said she had never successfully taught a leftie. After the first lesson I shattered that record. I’m the only one in my family (parents, two brothers, plus 2 nieces and a nephew) who is left handed. What I hated about being left handed in grade school, is the way the kids’ desks were made; all for right handed kids. None for us lefties. As an adult, one of the things my dad told me, was that I “couldn’t do certain things (like using a hammer to nail boards) because I’m left handed.” Gee thanks, Dad for messing with my mind. 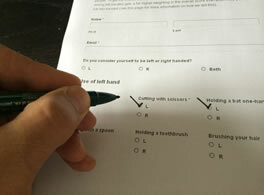 As a lefty, you can do anything you want, no problem.